collaboration and science to best manage our river system." Today, a bipartisan bill to protect the lower Columbia and Snake River Dams passed the House by a vote of 225 to 189. This effort, introduced by Eastern Washington Congresswoman Cathy McMorris Rodgers (R-WA) alongside Reps. Dan Newhouse (R-WA), Jaime Herrera Beutler (R-WA), Greg Walden (R-OR), and Kurt Schrader (D-OR), will protect the dams by codifying the 2014 Biological Opinion, a collaborative agreement on how to manage the river system to protect fish and support clean, renewable energy. In March of 2017, U.S. District Judge Michael Simon issued a court order requiring federal agencies to increase spill over the Columbia and Snake River dams. This order, which formally began on April 2nd, is expected to cost taxpayers roughly $40 million. Many scientists contend that spill leads to increased dissolved nitrogen and other gases in the water that can kill fish. "I have heard from countless constituents expressing strong support to defend the clean energy and many economic benefits provided by the dams in Central Washington, which is why I introduced this bipartisan legislation with Congresswoman Cathy McMorris Rodgers and Pacific Northwest colleagues," said Rep. Dan Newhouse (R-WA). "The current Biological Opinion was negotiated with input from a diverse group of local stakeholders and provides a collaborative framework for dam operations that balances energy production with fish recovery efforts. I strongly encourage my colleagues in the U.S. Senate to act to preserve our dams and maintain low energy rates that families rely on in the Mid-Columbia region. I am grateful for the support from my House colleagues on both sides of the aisle in approving this legislation to save our dams on the lower Snake and Columbia Rivers." Newhouse told Cherry Creek Media after the vote that lawmakers, scientists, northwest tribes and other stakeholders have been grappling with the balance between salmon migration and dams along the Columbia and Snake Rivers for the last 20 years. "Dams and fish can coexist, and after more than two decades in the courtroom, let's let scientists, not judges, manage our river system and get to work to further improve fish recovery efforts," said McMorris Rodgers . "When the sun doesn't shine and the wind doesn't blow, our dams provide critical baseload energy to power homes and businesses all across Eastern Washington and the Pacific Northwest. Not only that, they provide transportation and irrigation benefits for our farmers, flood control for our communities, and recreational opportunities that fuel our economy. This isn't about the merits of protecting salmon, we all agree on that. This is about providing certainty and letting experts and scientists in the region, who know the river best, work collaboratively to meet that goal. I'm proud to usher this legislation through the House." "There's only one sensible way to balance the health of our salmon runs with residents' need for low-cost, hydropower energy in the Northwest – and that's to restore a scientifically-backed operations plan," said Herrera Beutler. "On behalf of our salmon, our Northwest ratepayers, our economy, and our environment, passing H.R. 3144 is vital to ensure that we're relying on collaboration and science to best manage our river system." "Our bill finally codifies that science, not politics or the courts, should dictate the best way to balance fish recovery and the power needs in the Pacific Northwest," said Schrader. "Scientific experts steeped in fish recovery and clean renewable energy will be able to do their job based on good science rather than an ideological crusade to eliminate dams on the river system resulting in the loss of our region's best carbon free energy asset. Simply put, the Columbia River Power System will be managed according to the 2014 Obama Administration approved biological opinion until a new BiOp can be completed by 2022, saving ratepayers millions of dollars. I am pleased to have worked with Rep. McMorris Rodgers, and our Pacific Northwest colleagues, on this bill to bring science back into the equation for our Oregon and Pacific Northwest Salmon recovery efforts." "In Oregon and throughout the Pacific Northwest, we are blessed with a river system that allows goods to flow to market and provides renewable hydropower that generates 43% of electricity in our state," said Walden. "River operations that have been guided by years of research by federal agencies, tribes and other cooperators have now been threatened by court order, and Northwest families and our communities will likely pay the price in higher power rates. This legislation provides needed certainty for power generation and river operations while federal agencies update the biological opinion and court proceedings continue. This is important for our ag communities, renewable energy generation and power users across our region. I was glad to work with my colleague from Oregon, Kurt Schrader, to pass this legislation through the House, and I hope the Senate will act promptly on this bipartisan plan." 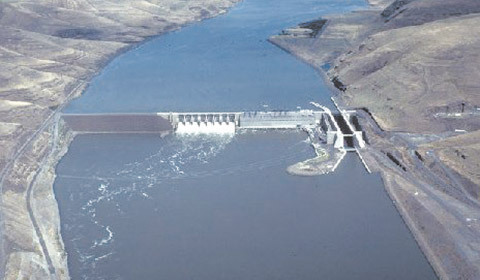 Bill to Protect Columbia and Snake River Dams Passes House <-- Watch and Listen at orginal site.